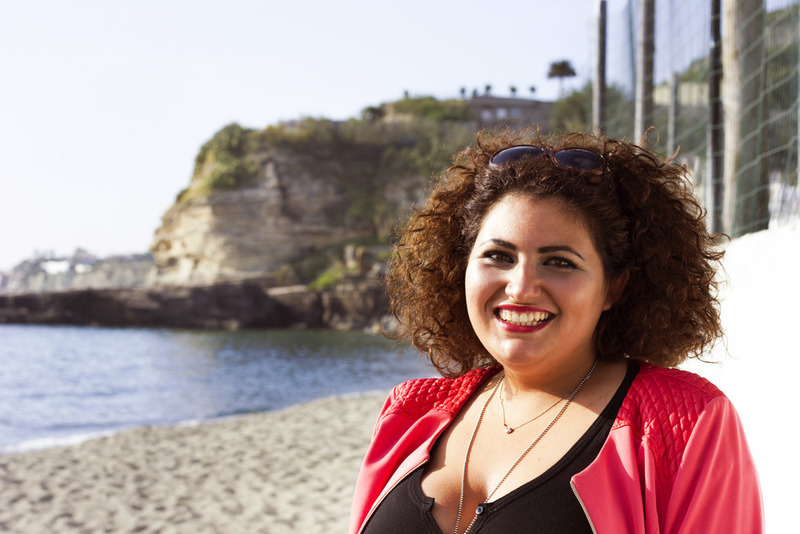 "I'm going to show my students this"
Brigida Manco has lived on Ischia for most of her life and has seen the island transform from an agricultural market place with few roads to a tourist destination for people from all over the world. We talked inside the house she was born in and she would constantly point out landmarks from her window. More. . .
"Greg lets go to the beach for my picture"
Ludo and her family run two of the biggest clubs in Ischia. During the week she takes the ferry to Naples to attend school and on the weekends comes back to the island. She is the ideal person to have as an Ischiatani Night Life Ambassador. More. . .
"Try and get the boats in the background Greg"
Dion is the owner and operator of IschiaReview.com, a information and booking service for all things Ischia. He offered to meet us in Forio and tell us about his time on the island and tourism industry. More. . .
"We all try and out do eachother with our meals." The Arcamone Family has run Ristorante Il Borghetto now for 12 years. I had the honor to sit down with Mimmo and talk about the restaurant business on the island. As we looked over the Gulf Of Naples drinking vino bianco I learned about the passion and work it takes to run a business on Ischia. More. . .